Opinion Forum » Will the United States Make the Fantasies of a Young North Korean Come True? How close are we to becoming what the young girl in this North Korean video thinks all countries should become? The North Korean propaganda video presented below was released several years ago and was apparently designed to show the life of a family in (comparatively privileged and tightly controlled) Pyongyang. In it, a girl studying to become a teacher praises her and her family’s happiness granted by a government that provides everything for them. 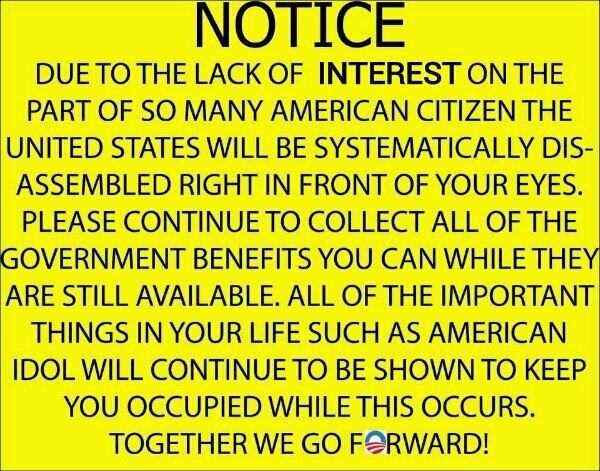 They in turn give the government their full devotion; it appears to own them. She compares their happy existence to the depressing plights of others outside the Democratic Peoples’ Republic of Korea (DPRK) who, she was told, probably believes and will likely teach, lead miserable lives of starvation and homelessness because their governments do not provide for them as does her DPRK fantasy. Here’s a rather different video. The DPRK is neither “democratic” nor a “republic.” With about one percent of its population held in torture/labor camps, it is an hereditary and centrally controlled dictatorship. It is led by a regency that presents Kim Jong-un as the rightful and divine successor to Kim Jong-il, endowed with not only his father’s god-like qualities but those of his grandfather, Kim Il-sung, as well. His obituary in state media called him the “illustrious commander born of heaven,” and on Wednesday, KCNA said a Manchurian crane spotted in the city of Hamhung circled a statue of Kim Il Sung for hours before dropping its head and taking off toward Pyongyang. The crane is a traditional Korean symbol of longevity. Here are a few recent headlines from the Korean Central News Agency (KCNA). They include such reporting as this: DPRK People Confident of Victory in Faceoff with U.S.; U.S., Common Enemy of World’s Progressives. A KCNA news release about the current “state of war” refers to Kim Jong-un as “Marshal Kim Jong Un, the greatest-ever commander. (Emphasis added. )” Kim Il-sung, an experienced and competent military commander in comparison to Kim Jong-un, may have rolled over in anguish in his crypt at the reference to his grandson as the greatest ever. The Kims are not alone in their deification. El Presidente Chávez of the Democratic Peoples Republic of Venezuela seems to be doing quite well in the afterlife. Venezuela just can’t quit Hugo Chavez. The former Venezuelan leader died March 5, but the collective mourning and the figurative pouring out of a little liquor continues, including imagining what he’s doing in the afterlife. That would be walking through a meadow and chilling with his homies. A bizarre minute-long animated spot titled “Goodbye Forever Commander” is currently airing on a state-run station. The clip opens with a frowny face Chavez, wearing strange blue sandals (no socks, two toes on each foot exposed) and a track jacket in the colors of the Venezuelan flag, walking across a meadow. He comes to a clearing with a thatched-roof house and … fellow revolutionary friends: Simon Bolivar! Che Guevara! An anonymous indigenous fellow! Chavez breaks into a beauty-queen smile. Frivolity and fiery rhetoric ensue. CARACAS (Reuters) – Venezuela’s acting President Nicolas Maduro on Saturday called the country’s opposition “heirs of Hitler,” accusing them of persecuting Cuban doctors working in the South American country the way Jews were persecuted in Nazi Germany. His barbs added to weeks of insults in the run-up to the April 14 presidential elections triggered by the death of socialist leader Hugo Chavez this month. Polls show Maduro with a double-digit lead over opposition rival Henrique Capriles. Is there a Religion of Obama in the United States? Is He the Second Coming? 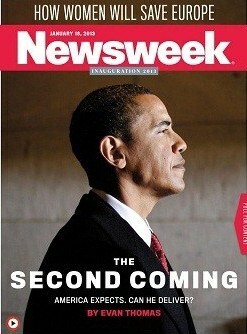 Deification apparently works for the Kims and for Chávez, so President Obama must deserve similar devotional deference. Similarly, his opponents need to be despised as Hitler-like. Is that what the Reverend Mr. Sharpton had in mind here? Religiously oriented references to President Obama have become common. How many in the United States belong to the Religion of Obama? Do they feel that their more traditional religions have failed them? 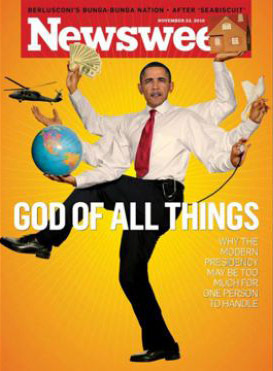 The adjacent Newsweek cover depicted President Obama as the God of All Things. The first President who held office during my lifetime was Franklin D. Roosevelt. Prior to President Obama, I had never seen a President of the United States worshiped as President Obama is. Revered, respected, feared, loved and hated, but neither beyond reproach nor worshiped. “I think an overwhelming portion of the intensely demonstrated animosity toward President Barack Obama is based on the fact that he is a black man, that he’s African American,” Carter said. The Republican party today issued a denial, saying Carter was “flat-out wrong” and that opposition was not because of Obama’s skin colour but his policies. Carter, who aired his views in a television interview and at a public meeting in Atlanta, Georgia, on Tuesday, is the most senior Democrat yet to voice what many in the party have been saying both in public and private after the Republican Congressman Joe Wilson shouted “You lie!” during Obama’s key speech on healthcare reform in Congress, after anti-government demonstrations over health that have been almost exclusively white, and after the increasingly aggressive tone on rightwing talk shows. “Look all of this ‘othering’ of Obama, like he’s from some other planet. Everything he does is subject to a different lens and seen through a microscope that really tends to pick him apart,” Dyson said. How librully politically correct not to want to talk about that! Yet it is apparently acceptable for some Obama supporters to characterize Dr. Ben Carson as a “token” conservative “Oreo,” an “Uncle Tom,” because he dares to disagree with President Obama. On Tuesday Dr. Carson spoke with Fox host Megyn Kelly about accusations made by some on the left, namely MSNBC media pundit Touré, that Carson is just a token. If you remember, Touré said last week that Carson’s job was to “assuage the guilt” of white Republicans. Kelly read off some of the names that Carson has been called – such as “token” and “oreo”- since he became part of the political conversation, then quoted a “commentator from a rival network” who said Carson was benefiting from reverse affirmative action by the GOP. Dr. Carson then parroted people like Allen West and Herman Cain, saying, “they feel if you look a certain way, then you have to stay on the plantation.” Dr. Carson noted that he’s been called an Uncle Tom, but says that people who sling that word around don’t really understand its meaning. “Obviously they don’t know what an ‘Uncle Tom’ is,” he said. In the novel, “he was very, very subservient, kind of go along to get along type of person. Dr. Carson must, in the view of such President Obama’s supporters, be a “racist” because he does not “go along to get along” with President Obama. Is he also of the wrong “religion” because he fails to worship their god-like President Obama? Although apparently acceptable to refer to him as an “Oreo,” it is perhaps librully politically incorrect also to suggest directly that he is of the wrong religion. Is there no better explanation for disagreements with President Obama? I think there are many — his general incompetence and narcissism, a sickened economy with a soaring national debt and excessive spending — much of it evidently to garner votes for President Obama’s political and ideological allies — excessive regulation, insistence on defeating the Global Warming Devil by higher taxes on the carbon it is claimed to eat, ObamaCare, attempts to infringe the First, Second and Tenth Amendments, and many more. And many canaries are dying. Also in my view, President Obama has done more to promote racism and other highly divisive distractions for political gain than had any other president, at least during my lifetime. The President of the United States is, you know, our boss. But also, you know, the president and the first lady are kind of like the mom and the dad of the country. And when your dad says something, you listen. [And] when you don’t, it usually bites you in the [expletive] later on. So I’m here to support the president. Perhaps if we all “belonged” to the Government Mr. Rock would be correct. If we all “belonged” to the Government, wouldn’t we also be its slaves? With appropriate governmental overseers? We already have too many, often employed in cabinet offices and “alphabet agencies.” North Koreans “belong” to their Government and it is said to provide for all of their needs. We don’t “belong” to the Government, it does not and should not provide for all of our needs. We aren’t its slaves and President Obama is neither our “dad” nor our “boss.” We are all (or should be) Americans, free to prosper from our own efforts, to think and to speak our minds. There is a big difference between being an American and “belonging” to any Government, American or otherwise. Just as President Obama is not my (or our) “dad” or “boss” so is he not my (or our) Commander in Chief; former Presidents were commanders in chief of the U.S. Armed Forces — but not of its many civilian citizens and other residents. I hope that no future President will ever be. But how many people view him in that light? Some even seem to expect him to perform miracles (such as halting the rise of the seas — even Moses is said to have parted only one of them) as though he were a god or empowered by one. Here is an ad posted by BarackObama.com in support of his reelection. If he is our “dad,” and our “first time” should be with him, the suggested relationship seems to be at least metaphorically incestuous. That campaign effort seems to have been successful with many young female voters. Are the United States turning, albeit slowly and against tepid resistance from our Republican political “leaders,” into a quasi-religious, statist society where the “free stuff” crowd and its enablers relish (while seeking more of) the gifts they believe are bestowed by a loving father government upon his its worshipful children that the recipients are satisfied to be his its willing property — and hence slaves? Are we approaching the embellished life of the girl in Pyongyang? Obviously, everything comes from “Obama’s Stash” — not involuntarily from the fruits of the work of many others; right? The Democrats have become the party of Homer Simpson — a party reliant on millions of low-information voters seeking something for nothing. Like the Democrat dependency class, Homer Simpson (D-Springfield) relied on Mojo the Helper Monkey to feed him and even wipe the sauce from his face. The pair eventually gorged themselves into a stupor. The Democratic Party has become the party that promises millions of helper monkeys, but those of us who work and pay taxes are the helper monkeys for Homer Simpson. The Democratic Party has become the something-for-nothing party. Their policies will eventually lead to destruction of individual initiative and, like Homer, even an individual’s dignity. We helped to dig the pit. Can we climb out of it? Whatever permitted President Obama to win his grossly undeserved reelection has to be changed. The constitutional prohibition against his running a third time will not suffice (think Hillary and perhaps Michelle) and the problems will not go away on their own. Simply moaning will not help and doing nothing beyond moaning will probably make it worse. As John Hinderaker at Power Line points out by posting the texts of many e-mails sent to those assumed to be party faithful, the Democrats are busy fundraising and trying to spread fear and hate while the Republicans are not. How dissimilar to the Democrat efforts are those of the Venezuelan Chavistas to demonize their opposition? During the past week or so, I also received many similar e-mails from President Obama’s Organizing for Action colleagues including two on Easter Sunday — one wished me a Happy Easter, the other did not. Others received three such Easter e-mails. Should the Republicans adopt a similarly lowbrow strategy? I don’t think it would work. It is a truism of social science that conservatives tend to be happy people, while liberals tend to be bitter, unhappy and angry. I don’t think you could rally conservatives behind a message that is essentially one of hate, even if you wanted to, which the Republican Party doesn’t. So where does that leave us? Time will tell, but I am afraid that there is, indeed, a Snidely Whiplash in this melodrama; only it is the Republicans, not the Democrats, who are being tied to the railroad track, and the train bearing down on them has a big D on it. We may be “happy,” but that is not enough. I think that effectively, promptly and in any event well before the 2014 election, we need to do either or both of the following: (a) establish and fund a vibrant conservative political party and/or (b) substantially divert the Republican Party from its misguided Democrat Lite path to peace superhighway to yet another election defeat or — perhaps worse — to more of the same as it worsens, even if a bit more slowly, under Republican leadership. 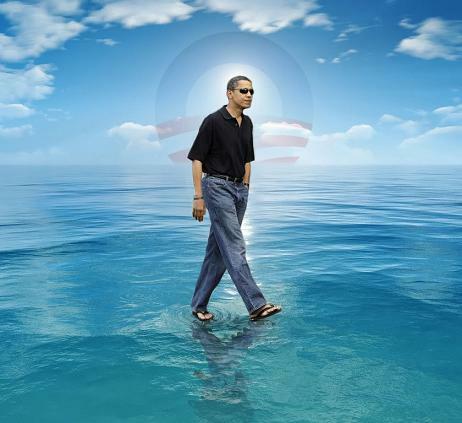 Following President Obama’s reelection, I offered ideas here, here, here and elsewhere at my blog. I also suggested that some of our once “conservative” media are deteriorating, perhaps to entice the ubiquitous “low information voters.” Is that useful beyond their bottom lines? Will such media revive or be replaced with better? Beats me. Bill Whittle suggested some great ideas here as he has also done elsewhere. However, I have seen very little movement in any of the suggested directions — or in any other useful directions. An alternative might be to give in, go with the flow and stop worrying. 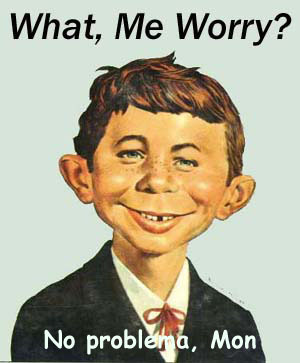 That was probably fine with the Mad Magazine Kid; I hope it is not fine with us.